Can you handle this much printer? Updated January 20: The Epson WorkForce Pro WF-8590 and WF-8090 will be available starting January 21. Epson first introduced its "game-changing" WorkForce Pro printers in March, and today's it's added two new printers to the family: the WF-8590 and WF-8090. Aimed at small and medium businesses (SMBs), the multifunction WF-8590 and single function WF-8090 use Epson's "next-gen" PrecisionCore printing tech to crank out a duty cycle of 75,000 pages at up to 24 pages per minute. The machines' "ultra-high yield cartridges" can produce up to 7,000 total color pages, while they hold 1,830 sheets with optional paper trays. They can print sizes up to 13 by 19 inches. According to Epson the new WorkForce printers offer cost savings of up to 40% compared with color laser printers. But "these new Epson models are designed to augment traditional 'big iron' machines - not replace them," Epson America Business Imaging Director Larry Trevarthen said in a press release. 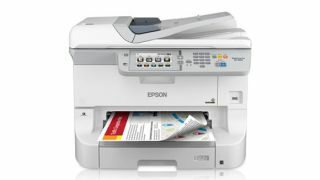 Epson's WorkForce Pro WF-8590 and WF-8090 will be available in January next year, but don't think you'll be able to walk into Staples and carry one out to your minivan - they'll be sold only to Epson ImageWaySM channel partners and through certain commercial channel resellers.